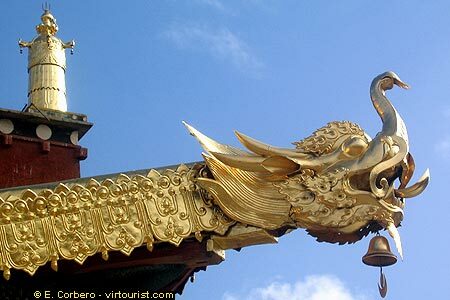 In the picture you can see a detail of one of the golden statues that decorate the roof of the monastery. The town of Shangri-La is well connected by air with Lhasa and Kunming via its airport (DIG). Currently there are no other direct flights to Shangri-La Airport, though. Shangri-La city currently has no train station. You can get from here to Lijiang by road. It takes around six hours. From Shangri-La you can start your journey to Lhasa by jeep, too. Shangri-La is also a starting point for trips to Litang and Tibetan Sichuan.